A Stream is a general name given to a flow of data. Each stream is associated with a particular class, which contains member functions and definitions for dealing with that particular kind of data flow. Stream Class Hierarchy: The ios class is the base class. It contains many constants and member functions common to input and output operations. E.g. showpoint and fixed flags used for numeric output. 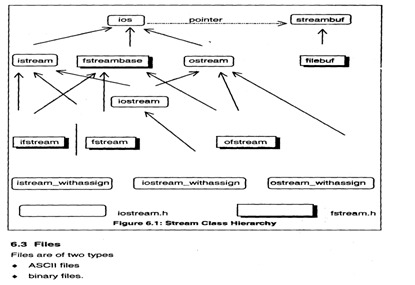 The ios class derives two classes - istream and ostream. The istream class includes all functions for input of data. It includes member functions like get(), getline(), read(). The overloaded extraction operator>> is a member of the istream class. 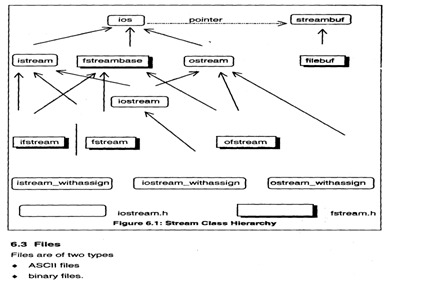 The cin object, representing the standard input stream, usually directed from the keyboard, is a predefined object of the istream_withassign class, which is derived from the istream class. The ostream class includes all functions for output of data. It includes member functions like put(), putline() and write(). The overloaded insertion operator << is a member of the ostream class. The cout object, representing the standard output stream, usually directed to the video display, is a predefined object of the ostream_withassign class, which is derived from the ostream class. 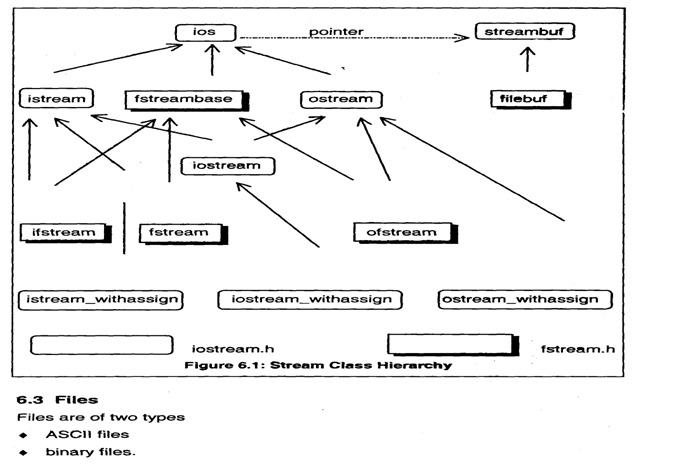 The iostream class is derived from both istream and ostream class by multiple inheritance. The iostream_withassign class is derived from iostream class. The classes used for input and output to the video display and keyboard are declared in the header file iostream.h. The classes used for disk I/O are included in the file fstream.h. fstream.h incorporates iostream.h. Therefore, you need not explicitly open iostream.h. 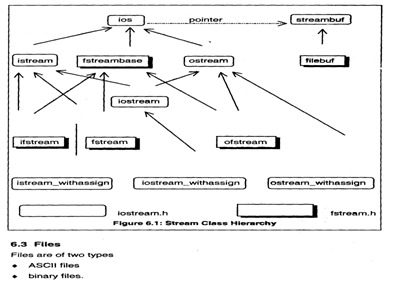 The hierarchy of the classes included in the iostream and fstream classes is shown in the form of a diagram. ASCII files are those files created by storing each character. They can also be called as text files. Binary files are those files created by storing a block of memory (array of structure or class) . These are also called non-ASCII files.